Drawing of an Aztec sacrifice. Human sacrifice is the act of killing a human being as an offering to a deity or other, normally supernatural, power. It was practiced in many ancient cultures. The practice was different in different cultures. Some like the Mayans and Aztecs are notorious for their ritual killings, others have looked down on the practice as primitive. Victims were ritually killed in a manner that was supposed to please or appease gods or spirits. Victims ranged from prisoners to infants to Vestal Virgins whose stomach's were cut open, with a dull,stone knife and their hearts were burned. Over time human sacrifice has become less common around the world, and sacrifices are now very rare. Most religions condemn the practice and present-day laws generally treat it as a criminal matter. Nonetheless it is still occasionally seen today, especially in the least developed areas of the world where traditional beliefs persist. The ancient Middle Eastern kingdom of Phoenicia practiced sacrifice of children to their god Moloch. It was believed to be evil by the Jewish authors of the Bible. 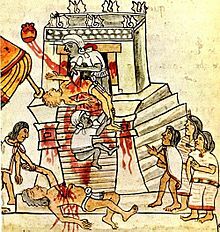 The Aztecs were particularly noted for practicing human sacrifice on a large scale; an offering to Huitzilopochtli would be made to restore the blood he lost, as the sun was engaged in a daily battle. Human sacrifices would prevent the end of the world that could happen on each cycle of 52 years. In the 1487 re-consecration of the Great Temple of Tenochtitlan many prisoners were sacrificed. A number of mummies of sacrificed children have been recovered in the Inca regions of South America. ↑ "Discovery Canada - Watch Full Episodes". Discovery.